the Indian government has at last informed a us court that it does not have any objection to the latter ordering the us-based Union Carbide company -- a subsidiary of The Dow Chemical Company -- to clean up contamination in and around its abandoned factory in Bhopal. The Union ministries of chemicals and fertilisers, and law and justice sent the communication after the intervention of Prime Minister Manmohan Singh. Activists and survivors of the 1984 Bhopal gas tragedy had been on a hunger strike in New Delhi for six-days to elicit a favourable response from the government when the step was taken. In the us, Southern New York District Judge John F Keenan had ruled on March 17 that the court could order Union Carbide to clean up the contamination only if India's Union or concerned state government "seeks to intervene in the action or otherwise urges the court to order such relief". The court set a deadline of June 30 for the submission of any statement by Indian authorities. Since then, activists and survivors of the tragedy had been requesting the Union and state governments to pursue the matter. The Madhya Pradesh government argued that the communication should go from the Union government since it is the competent authority to take all action regarding any claims or liabilities related to the tragedy. Activists hold the law ministry partly responsible for the delay in sending the communication. A representation requesting for the no-objection certificate was lying with the ministry since March 25, but it was ignored. "The confusion emanated because the law ministry officials mistook it as pertaining to the Bhopal gas leak incident, for which a settlement has already been made. However, the current litigation is related to the dumping of toxic materials between 1970 and 1984," says Satinath Sarangi of the Bhopal Group for Information and Action, an activist group. 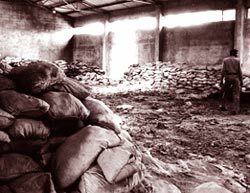 It is said that 2,000 tonnes of highly toxic chemicals still lie abandoned inside the factory (see: 'Nurturing Bhopal', Down To Earth, December 15, 2003).